Betty Simmons sits leisurely on the back porch at 2515 Holman, in Houston’s historic Third Ward with a big, round metal pot in her lap and a curtain of voluptuous hydrangeas as her backdrop. She has a small knife in one hand, peeling what appears to be potatoes. Her white hair is brushed back away from her face, revealing a surprisingly supple and healthy look for a woman of nearly 100. The chain link of a porch swing is barely visible beyond the ornate railing. Betty is one of five Jemima Code women who are on exhibition through June 19, at Project Row Houses, Round 34 Matter of Food. My artist friend and Peace Through Pie partner Luanne Stovall and I are co-curators of Hearth House, a traveling installation where Betty and the cooks of the Blue Grass Cook Book (the Turbaned Mistress, Aunt Frances, Aunt Maria and Aunt Dinah) are capturing the hearts of visitors just about as much as they enchant us. Some years ago, as I fretted on a Southern Foodways Alliance excursion over the loss of these women, my friend and mentor John Egerton asked me whether they were haunting me. I shared his silly question with some artsy friends who were having their own unique, spiritual responses to the women. Before we knew it, the idea for the Project Row Houses exhibit materialized. That phenomenal creative team (Ellen Hunt, Meeta Morrison, Luanne and I) digitized and enlarged the women’s images onto seven-foot-tall, transparent screen-like fabric that is suspended from the ceiling in one of seven shotgun-style houses at PRH. Of course, we all knew that in order to break the code, the space had to be beautiful, so the walls were painted in warm colors that bring thoughts of sweet potatoes, sorghum and sunflowers to mind. The text is minimal — drawn from the inspirational words of Mary McLeod Bethune and from the women themselves. And, a fourth wall, painted in chalkboard paint, provides a space for the community to share kitchen memories and pie stories (which we erase periodically to symbolize the way the women were erased from history). A rough-hewn long table invites guests to linger and to leave their kitchen tales on recipe cards that will become part of our permanent archive. When the banners were first unrolled, I actually lost my footing and crumbled onto the floor. And cried. I’d spent so many years waiting for these women to finally be honored. To top it off, on our final day of installation, my mother noticed that as I stood on the back porch of the house just beyond the screen of my favorite, the Turbaned Mistress, my silhouette was eerily superimposed into the screen like the shadow of a child, ready for tutelage at her side. Thank goodness she had the sense to photograph the moment. Obviously, the mystery of the women is very personal. And, it is palpable. Since Opening Day, people visiting the exhibit have written to confess their experiences, too. They tell me how Aunt Frances looks over them in different ways depending upon the sunlight, or when the hot, humid breeze blows through the house at different times of day. Is there something special to know about Betty? Betty was one of those extraordinary slave girls, who grew up in the kitchen in the shadow of a phenomenal Texas cook who had absolutely no idea she was saving a child’s life as she passed on culinary skills casually, one meal at a time. But, she did. Betty was born a slave to Leftwidge Carter in Macedonia, Alabama, then she was stolen as a child and sold to slave traders, who later sold her in slavery here in Texas, where her cooking skills protected her from a harsh life of field labor in slave times, and helped her manage scarce resources in freedom. She was interviewed at a time when national pursuits – from board games and radio to mystery novels by Agatha Christie – helped Americans escape the rigors of Depression-era living, and field writers for the Federal Writer’s Project recorded the life stories and oral histories of former slaves. Sadly, the government didn’t think to ask many questions about food and cooking, but I’m not mad at them. Fortunately for all of us, the conversational style of Betty’s narrative gives an intricately detailed look at the precarious life of a slave cook working at a Texas boarding house. I learned a little about humility, charity and self-respect from Betty. And, after months of putting the wrong things first in my life, I’m hoping she will help me get my priorities straight from today forward. What do her words encourage you to do? When massa Langford was ruint and dey goin’ take de store ‘way from him, day was trouble, plenty of dat. One day massa send me down to brudder’s place. I was dere two days and den de missy tell me to go to the fence. Dere was two white men in a buggy and one of ‘em say I thought she was bigger dan dat,’ Den he asks me, ‘Betty, kin you cook? I tells him I been the cook helper two, three month, [Betty’s aunt Adeline was the Langford’s cook] and he say, ‘You git dressed and come on down three mile to de other side de post office.’ So I gits my little bundle and when I gits dere he say, “gal, you want to go ‘bout 26 mile and help cook at de boardin’ house? We work de plot of ground for ourselves and maybe have a pig or a cuple chickens ourselves…We gits on alright after freedom, but it hard at furst ‘cause us didn’t know how to do for ourselves. But we has to larn. this exhibit is worth the drive to houston. 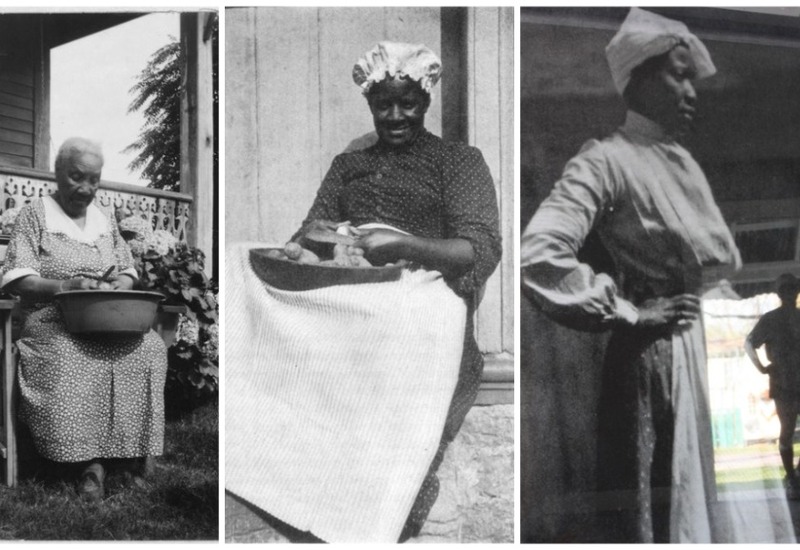 thank you for encouraging black women to reclaim their culinary role in american history. it’s about time. actually, it’s quarter past time…apparently egerton’s question wasn’t so silly after all,yes? Dear Toni, It is an such an honor and pleasure to become acquainted with the stories of these beautiful resourceful women who are indeed true “keepers of the flame”. Indeed, their spirits light the way for us in these tumultuous times. Thanks for all you are doing – such a pleasure working together! Poignant, lovely article…thanks so much. It is hard at first, and sometimes in the middle, and sometimes at the end, too. What an inspiring story, Toni. Thank you so much for sharing. Yes, Ellen, it is time, and thankfully, more and more people are realizing just how important these women were. Thank you, Luanne, for bringing another dimension to their beauty. So glad you are here, Izzy. Addie, this such a great message for us all when we think we can’t make it. What is a Jamima Code woman and how did my great-great-grandmother, Betty Simmons, become one. Lloyd ,,, that’s my brother…Everyday i say a prayer for the soul of Betty Simmons since about twenty years ago when My aunt Mayetta who looks a whole lot like my great-great- grandmother narrated my Mother’s side of the family tree. I never thought I would see her and that she would be bigger than life. Lloyd Johnson and Bilal Sunni-Ali. are my cousins. Our mothers were sisters. The first time i remember hearing Betty Simmons was at the Family reunion in Silsbee, Tx. where all the sisters mentioned her. Thanks to Loyd and Veronica who did the family tree,( which i am trying my best to get my hands on again to pass it on to this younger generation) so they will know where they came from and who their fore parents were. This is a joy to see and read. Jesse E. Moffett is my father and what a blessing to read. I don’t know many people that have the opportunity to show someone their grandmother’s grandmother and to be able to show my kids! The Lord always shows up on time with work,family,and my kids some days are rough but I have a consistent prayer life so I have faith to keep holding on and today this was a big encouragement and reminder of why I have to keep on pressing on. I watched my grandmother go through somethings and keep quiet and I thank God for being able to soak all that wisdom from her and though I was young I watched her and now that I’m older I know how to react to different situations in my life. These women are great examples of what we need today! Thanks for allowing me the chance to share with my family and friends. t-Great Grandmother as well. My mother’s name is Fannell Ethel Thompson Moffett, the Great Granddaughter of Betty Simmons. I would love to get a Family Reunion together so that we can come to Houston and tour facility.My children, Grandchildren, and Great Grandchildren need to know our people. Thank you so much for the time, effort, energy and Love that you have put into this project. Is this exhibition still available to be shown?…Where is Houston is it located? Lori, since I wrote this blog post, the exhibit has traveled from New York and Michigan and back in Texas. It is now in Austin at the French Legation Museum in the kitchen house where these women would have worked. I hope you will be able to experience it. Let me know what city you are in. Maybe we’ll travel there too! Thanks to everyone in Betty’s family. Your passionate comments help everyone understand why it is important to remember the “Ladies” of the Jemima Code. They were real people, who had real lives and feelings, and talents and gifts. And they have simply disappeared in history. This book and exhibit intend to change that.